"It was so painful" to leave the dogs behind, Paul Fowler says. "When we adopted, we promised them and we promised Best Friends (the organization that arranged the adoption) that these dogs would never be left behind again." The Humane Society of the United States was contacted and vowed to do what it could. Members of the animal rescue team from Humane Society International, Humane Society of the United States and the Humane Society Veterinary Medical Association finally were permitted into Haiti over the weekend. The big reunion with the family was yesterday in Miami, Florida. The family will be heading back home to New Orleans next week. Watch the reunion video at wpbf. 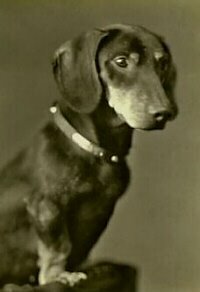 Happy Birthday to 'Heidi,' the wise red smooth Dachshund who hails from Mehlville, Missouri. 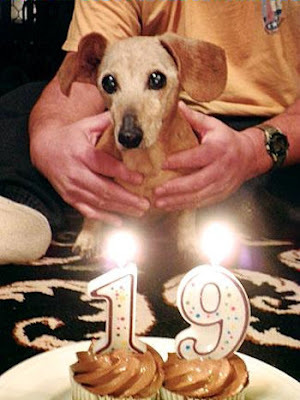 Heidi turned 19 on January 12, and was treated to candles and cupcakes. "She still gets up and gallops around for treats, though it takes a little while for her to get going," said her human. Read more about her at the South County Times. Bruce is the Man of the Hour. Besides amassing tons of titles, the 3-year-old has her own followers in the Dachshund Club of America newsletter, where she has an advice column. 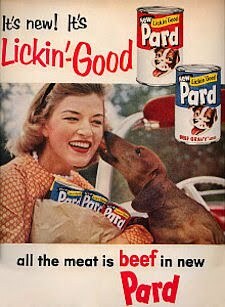 Carmen’s owner is also a writer, appearing in several books, including "Dogs ‘n Stuff" by J. Francis Bradley. 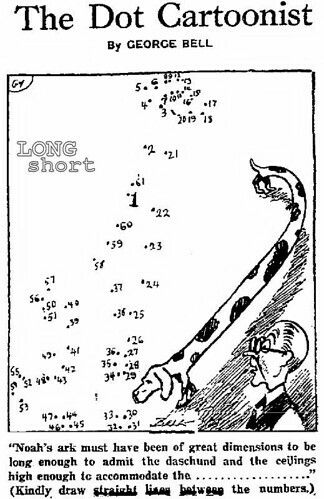 His story of "The Little Red Ball," appearing in "Dachshund, a Smart Owner’s Guide" by Ingrid Schwartz, has been widely circulated and is about Merriman’s special relationships with friends and their dogs. It should be read with tissues handy. Carmen is a "dual champion," having won conformation titles at Westminster and the National Dog Show. She’s already collared more than 20 major titles in her three short years. This is one "hot dog." Read all about this special girl at NJ.com. Jerome David "J. D." Salinger, January 1, 1919 – January 27, 2010, was an American author, best known for his 1951 novel The Catcher in the Rye, as well as his reclusive nature. Salinger died of natural causes on January 27, 2010, at his home in Cornish, New Hampshire. 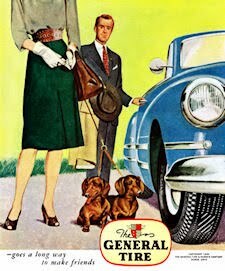 Which of course begs the question: like so many other literary geniuses, was Salinger a Dachshund Lover? He’s still a New Yorker. Now and then in a letter he’ll mention having a telephone conversation with S.J. Perelman—Sid—or going in to Manhattan to have lunch with William Shawn, editor of The New Yorker magazine, or getting a visit from a couple of longtime New Yorker writers who stop for lunch on their way back from a visit to Cape Cod. But mostly his visits will be with Sally, to work on homeopathy, and the Barretts, with whom he discusses his compost pile, or cordwood, or his tomato plants. He talks to me a lot about writing, but never about writers, except dead ones, and never about the current literary scene, which he avoids. (Though he eventually mentions a particular loathing for John Updike, who once published a highly critical piece about his work.) 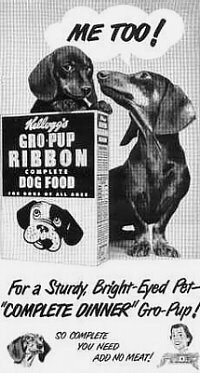 He writes about his dachshund, Joey, a trip to the health food store in White River Junction, a bet with Matthew that entailed not shaving for a week, getting his car fixed. Source. So there you have it, and his name was 'Joey.' RIP J.D. 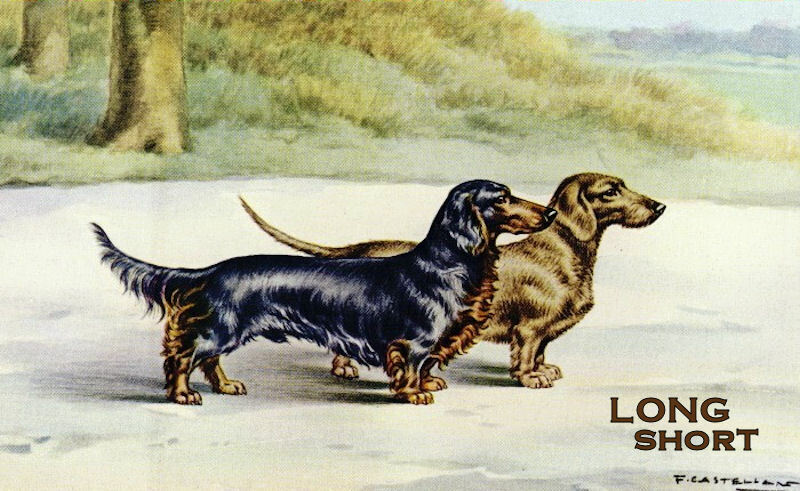 The loveable Dachshund continues its decline in American popularity according to the AKC 2009 registration statistics which were released yesterday, slipping to number 8 on the list. 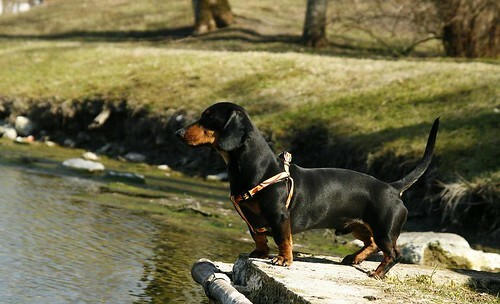 The Dachshund was the 6th most popular dog in 2006, and 7th in 2007 and 2008. 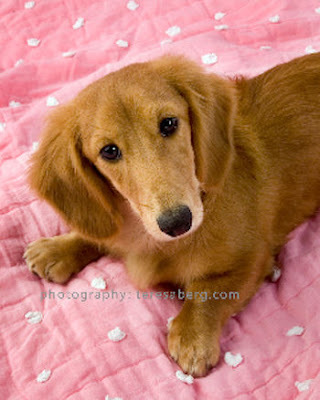 Popularity leads to irresponsible owners and breeders, so this is actually good news for the breed as a whole, although heaven knows how many Dachshunds aren't registered with the AKC every year. The bulldog has been rising in popularity over the last few years; they bounded to the spot right behind us last year, and overtook us this year. 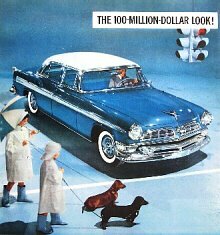 Read all the stats, and see how popular the Dachshund is in your city at the American Kennel Club. Meet 'Digby,' the handsome red smooth working Dachshund who hails near Hesperia, California. Digby is seen here retrieving a quail on Tuesday. 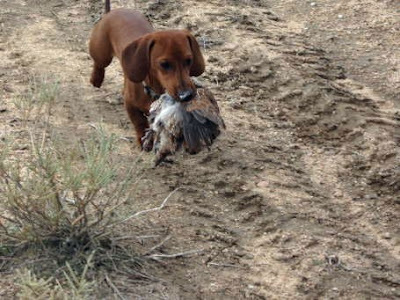 One hunter blogged about his hunting day, and notes about our hero: The surprise guest was Digby, the mighty Dachshund that belongs to the club manager. He is a fierce hunter and determined retriever. The quail is about 1/4 his size. He even tries to drag pheasants in too. All heart! If you enjoy hunting, read more at the Star Tribune. 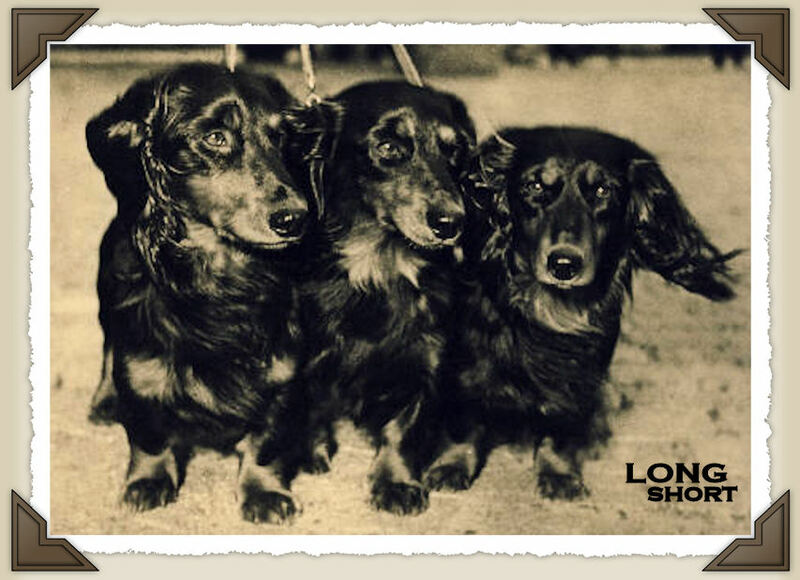 Fasten your seat belts, Dachshund fans. 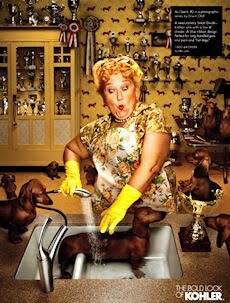 In case you haven't heard, there's a new family film in the works called Wiener Dog Nationals. The film will be produced by Patricia Gillum of Two Boys Productions, Inc., and is written by Kevan Peterson. The film will be distributed worldwide. 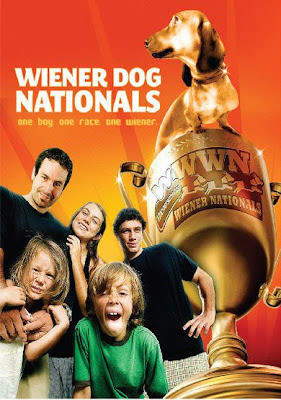 Here's a brief synopsis: "Wiener Dog Nationals" follows the story of a young boy and his adopted puppy. After the loss of his wife, Phil Jack adopts a dachshund runt from a shelter to help ease the pain of loss for his young son. It turns out that "Shelly" and her new family are in store for a new adventure as they enter the nation's "Wiener Dog Race." One Boy, One Race, One Wiener. Now, we know what you're thinking: "But Joey and Maggie, we wanna be in the movie - how can we win a walk-on roll?!" It's elementary, my dear Schatzie: win a contest on Facebook! To enter, a dachshund's Facebook profile must be created and must become a member of the Wiener Dog Nationals Facebook group. The winner will be selected based on the most creative page, the largest number of wiener dog friends, the strongest character development, and the best video and photo wall. 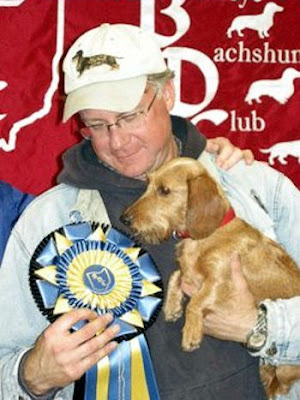 The contest is from now until April 15, 2010 - so show off your Dachshund pride! We'll do our best to keep you updated on the progress of this exciting new new film. Find out all about it at the official website. Woof, WOOF!!! 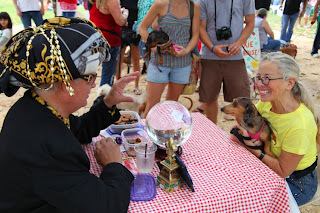 Hundreds of dachshunds and their humans descended on Miami Beach, Florida on Saturday, January 23, 2010 for the 8th Annual South Beach Dachshund Winterfest! We've been patiently waiting to see the photos, and they were finally posted yesterday on the official site. Don't even think about missing them! Looks like all the Dachshunds enjoyed the warm weather. We're jealous. Where is healthcare headed...just ask The Sheridan Avenue Boys...they know the answer. Thanks so much to the ever-so-handsome Sheridan Avenue Boys for keeping us in stitches. 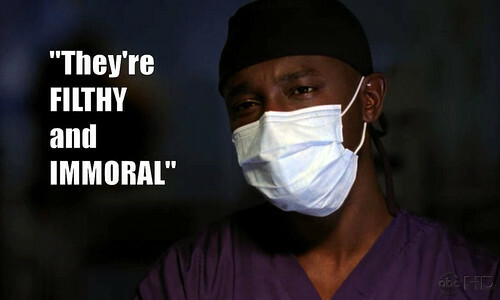 Maybe they'll have a guest spot on an upcoming Private Practice. 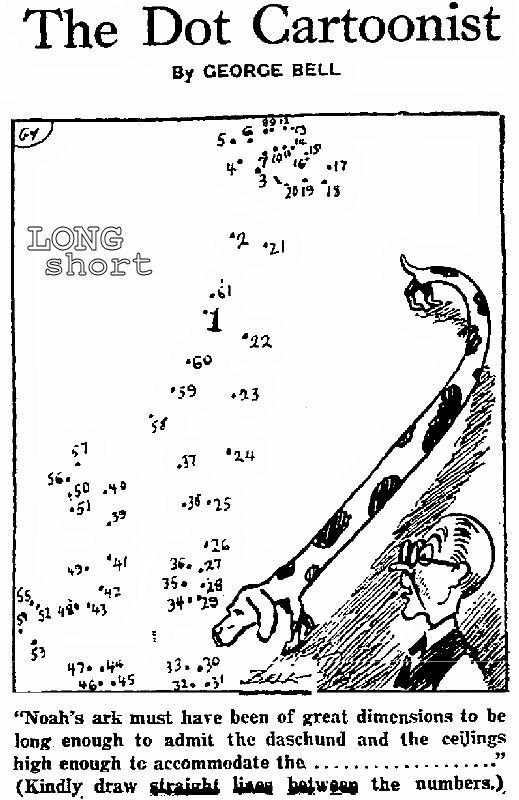 If the antonym of long is short, and if the antonym of short is long, then how do us Dachshunds even exist? Those Special Dachshunds: Meet Fiona! It’s a little late but Miss Fiona turned two last week. 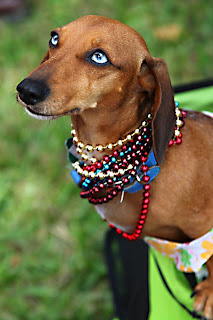 One of Max’s special friends and a graduate of DFW Dachshund Rescue, Fiona celebrated her special day by playing with her current foster brother Rudy and promoting her appearance as Miss April in the 2010 DFW Dachshund Rescue calendar. There are a few left - if you want one, now’s the time. You can get it here. As always, Fiona would also like to thank Miss Teresa Berg for making her look so wonderful! Adopt – Don’t shop. high enough to accommodate the ..................."
Here's that look which is all too familiar in a Dachshund Lover's household when it's time for breakfast. Your Long and Short of it All host 'Joey' displays that "feed me now, you're 5 minutes late" Dachshund mind meld. I'm such a good boy. I will die from starvation. I must have food. You WANT to feed me. My mind to your mind. My thoughts to your thoughts. Resistance is futile. Spock ain't got nothin' on a hungry Wiener Dog. Does this Dachshund look familiar? He should! We'll give you a hint: he's a deaf and blind rescue, and he hails from Michigan. Still no takers? One more hint: his nose knows. His likeness is meant to delight passersby and send them a serious message as well. “We're telling people to do adoptions rather than shop,” explained Pam Sordyl, founder of the Northville-based Puppy Mill Awareness Meetup of Southeastern Michigan. The group's public education campaign teaches about the origins of pet store puppies and lobbies for stronger laws and regulations for animal breeding. 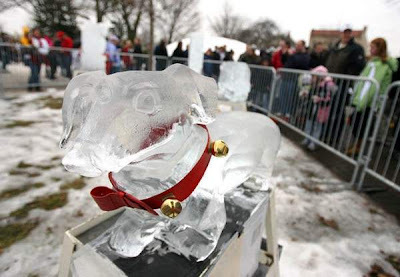 Last year the organization commissioned a carver to create a bulldog in ice and they attended the festival for the first time. “This year we have Rudolph. He's a puppy mill survivor and is doing good deeds,” said Sordyl, referring to Rudolph's visits, with owner Marcia Fishman, to schools throughout southeastern Michigan. Read more at Hometown Life. Photo: Amanda Kraft Photography; Ice Sculpture: Ice Concepts, Inc.
Can't get enough? Jenny and Rob were married last year in Philadelphia, Pennsylvania. 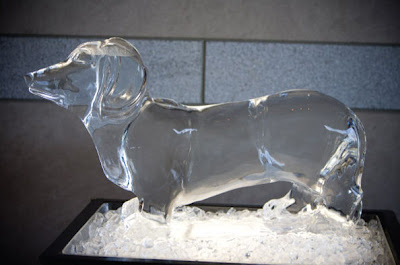 This is their beloved Dachshund 'Leo,' immortalized for the event. Brrrrr. Excuse us while we go and put on our sweaters. 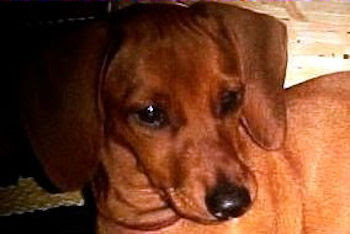 "He's a little chubby, about a 12-pound dachshund," human Cynthia Lockridge laughed. She let Peanut into the backyard, and he drew her attention to Harrell's house. "I saw the back of her house totally engulfed in flames," Lockridge said. The neighbor stopped a passing car, asking for help from the passerby. The two banged on the window until Harrell woke up. She had to tear the screen and open the window in order to escape the flames and smoke. She is thankful to have her life, and thankful to the dog she calls "her angel." Still, Harrell has lost her home and everything inside. We're so proud of you Peanut! And we're hoping that Miss Harrell can get her life back in order real soon after this tragedy. Read more at WLTX. 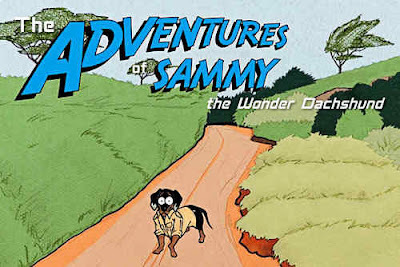 Sammy The Wonder Dachshund is back with a brand new book titled 'Sammy on Safari.' This is the second book in a series, and this time he's headed to Africa on assignment to dispel an internet rumor that Africa is overrun with kangaroos! The new book "teaches the importance of kindness and ignites a curiosity of the greater world." If you live in the Charleston, South Carolina area, don't miss several opportunities to meet the author (and Sammy?) at various book signings over the next week or so. Find out more at The Digitel Charleston. For Sammy's official site, click here. There is no photographer information yet for this photo entered in the cuteness cateogory of a photo contest at pxleyes. Surely it's bound to win! I sometimes watch peoples dogs while they are out of town. One dog was a 4yr old dachsund. I backed over it in the driveway and need another one before they get home monday. It was a reddish color, and hope they don't notice. I'm serious as a heart attack and need it preferably sunday. post flagged and removed yesterday at Craigslist, Los Angeles, California. KLTV out of Tyler, Texas tested these "As Seen On TV" doggie steps at the Humane Society of Smith County, where the director volunteered her own Dachshund 'Bubba' for a trial run. The steps were purchased at a local Bed, Bath, and Beyond for just $29.95. Read more at KLTV. If you're having trouble viewing this embedded video (like we are! - there is a conflict with another news video on the page), you can click on the title of this post and try viewing it there, or trying at the link to KLTV. It's worth the effort. 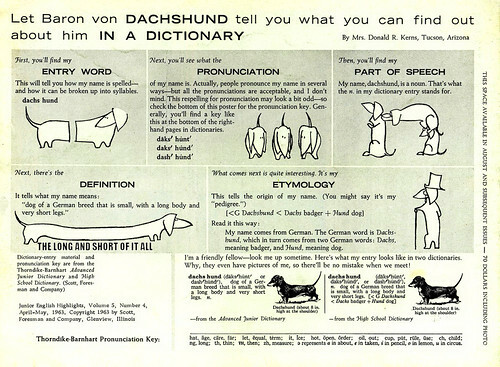 Let Baron von DACHSHUND tell you what you can find out about him IN A DICTIONARY by Mrs. Donald R. Kerns, Tucson, Arizona. It's education day at The Long and Short of it All. We've wanted to share this fantastic dictionary synopsis of the Dachshund for the longest time. 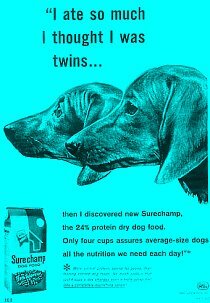 This was the back cover of the May, 1967 issue of the American Dachshund magazine. Dachshund 101, indeed; wikipedia ain't got nothin' on this masterpiece. 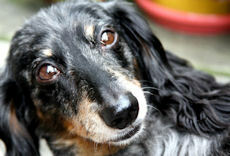 Dachshund Rescue of Bucks County & NJ [DRBC] is pleased to offer our 2010 Webinar Series. 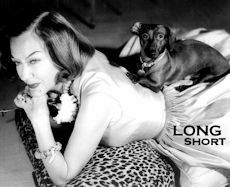 These on-line workshops are hosted by dachshund experts and are designed to help you have a long and happy relationship with your dog. There is a small donation fee charged for attendance with all proceeds donated to DRBC for the high medical fees incurred in the rescue and rehabilitation of our beloved breed. Cynthia Kura is Medical Director for Dachshund Rescue of Bucks County & NJ [DRBC], and has over 20 years experience addressing the medical problems associated with the dachshund breed. 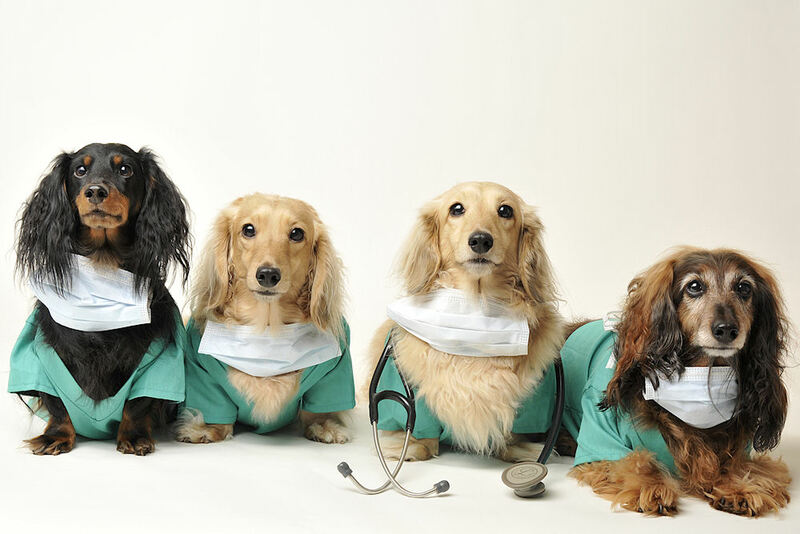 Dr Kura has worked to develop community education programs concerning pet health. She has initiated and managed vaccination clinics and has written medical standards for regional and national pet healthcare groups, which she works to maintain. 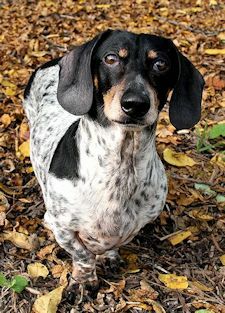 Dr. Kura has conducted breed specific research studies in conjunction with major universities and Veterinary Centers to prevent or minimize disk rupture in dachshunds and is currently developing a comprehensive nutritional program designed as an aid to prevention of early kidney failure in the breed. 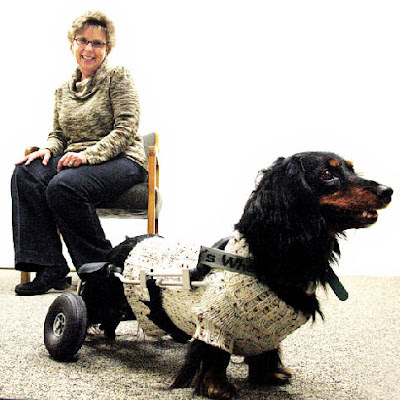 In her "spare time," Dr. Kura is "owned" by 8 special Dachshunds, who share her life and her home." To register go to Dachshund Rescue of Bucks County and click on the Webinar Registration Icon to the right of the topic. This will allow you to pay DRBC's Webinar Fee of $10 and register for the event. There are some great topics planned this year, don't miss them! Thanks to our friends 'Harley' and 'Chessie' for sending in the link! We sure do get ourselves in a lot of trouble sometimes. A cute smooth black and tan girl named 'Pepper' found herself stuck in a drain pipe yesterday afternoon in Tulsa, Oklahoma. Her human, Latrisha Wieden, called firefighters who used a camera to locate her, and then dug her out. Thankfully Pepper is fine after the 3.5 hour ordeal. Read more at NewsOn6. "I continued to holler and then all of a sudden she came out of the woods," Powers said. "At that point she was absolutely covered in blood." Powers rushed Madison to MedVet, where emergency surgery saved the dog's life. "Madison had surgery this morning to explore the open chest wound, have a chest drain placed, have neck wounds explored to make sure no vital structures in the neck were damaged," said veterinarian Dr. Anna Crosby. "You know, I would tease her that I couldn't switch out the laundry, or go to the bathroom without her following me," Powers said. "But I just can't even begin to tell you what I would give for her to follow me into the kitchen or even the bathroom. I would be tickled to death." Get well soon Madison. Read more and watch a video at 10 TV News. 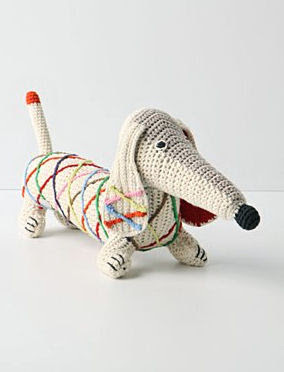 We've got a feeling that most of the crafty Dachshund Lovers we know could crochet one of these themselves, but if not, 'Dagney Dachshund,' stitched from end to end with rainbow plaid, begs to be your favorite snuggler at Anthropologie for a whopping $50. 15" long; Polypropylene; cotton fill. An unrestrained Dachshund in the car is being blamed for a bad accident which occurred on Saturday in Wichita Falls, Texas. "The dog may have been under the driver's foot at the time of the accident," Lana Fix, an Animal Control Officer, said. "So it wasn't restrained in any way." 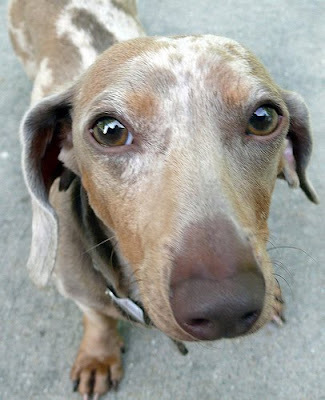 Human was taken to the hospital, Dachshund is at Animal Control until human released. Source. 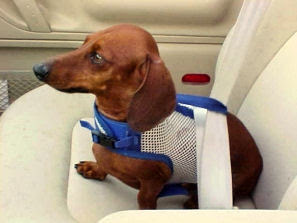 Get your Hold-A-Dox Harness at Dachshund Delights. Available in many colors in mesh (as shown), or pick your own fabric. We love ours; it's also a walking harness. 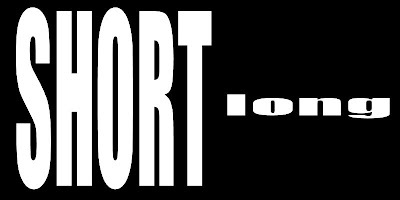 Enter HNY2010 in the promo code box during check out and save 10% through January 31, 2010. 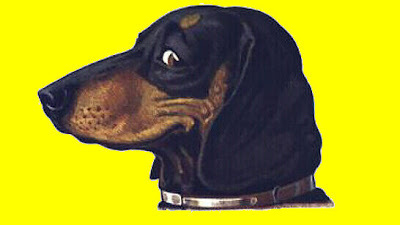 "Sloan is a DACHSHUND...Dachshunds like to eat POOP; right up off the street - other dogs POOP. They're more concerned with their OWN needs than they are with making you happy - they're FILTHY and IMMORAL. 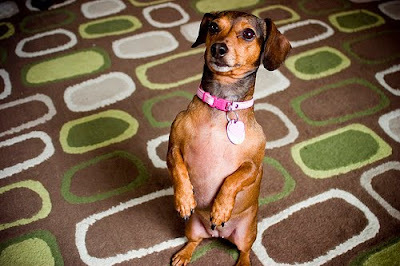 The OWNERS of Dachshunds are DESPARATE - desperate for AFFECTION. But it's the wrong KIND of affection; the kind that makes YOU always take care of THEM." This is Cooper from South Carolina (I am making Mom type for me). I am almost four months old and am close to having my humans trained, except for some reason they insist I must go outside to do this "potty" thing they often tell me about. I don't understand it really, I keep trying to tell them the carpet is much nicer. They even make me go outside in the rain, and I hate the rain! I try very hard to not go out when it's raining! Recently my favorite 8 year old human girl showed Mom her drawing for a science project, and it made Mom laugh and laugh. It's about me! 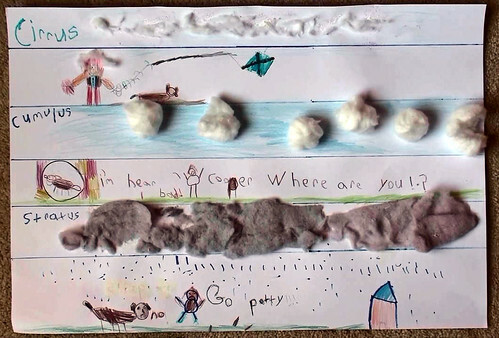 She made clouds and drew weather pictures to go with it, showing things we could be doing. We flew kites together, I ran away from her on a sunny day, but Mom thinks the best is the bottom picture! I thought you might find it funny. Lazarus Has a Little "Skippy" in His Step! Lazarus, a “tweenie” from Washington, D.C., with endless love for peanut butter, would like to know when the PR folks from Skippy will come calling with an endorsement contract. My husband and I adopted Lazarus in November. He had been taken in by a rescue group after he was discovered in an abandoned home, where he’d been living alone for nearly a month with no food. He was covered in fleas, had scratched off much of his fur, and was down to skin and bones. Thanks to the good care of the rescue group, and then the skilled hands of our really amazing veterinary clinic (VCA Old Town), Lazarus is happy, healthy and feeling very handsome again! So handsome, in fact, that he is ready to sign on as Skippy’s next spokesmodel! 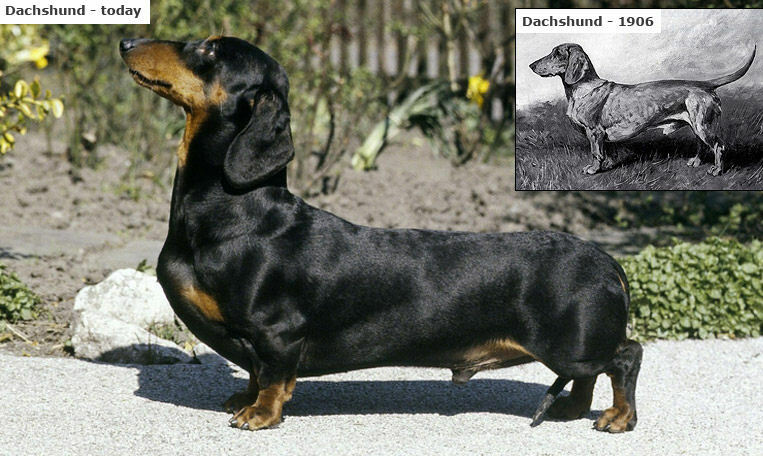 The Dachshund is one of 4 breeds featured in a short photo exposé on the changing shape of dogs by The BBC News, and states: The original German Dachshund was larger than the modern variety with longer legs. 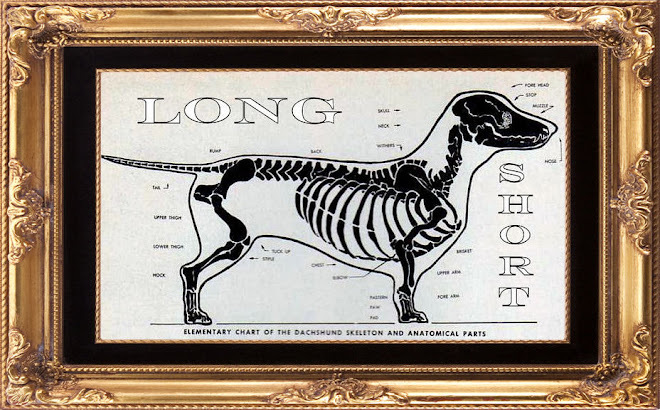 Today's short-legged breed tends to suffer from knee and also spinal problems because of its long back and short rib cage. This follows a new report which recommends that responsibility for the health and welfare of pedigree dogs be devolved to an independent body outside of England's Kennel Club, the oldest of the world’s all-breed kennel clubs. Read more about the report at BBC News. 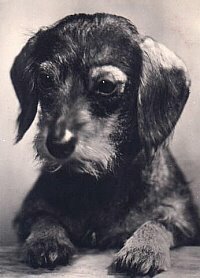 While we agree that Dachshunds should be bred for health over conformation, we've certainly featured photos in the past of Dachshunds from around 1900, like this one, which look much more like today's Dachshund than the drawing in the insert of the BBC's photo. Otto's human Mrs. Jones today said: “I’m devastated. I’ve had Otto since he was six weeks old. Our hearts go out to Otto's family and friends. 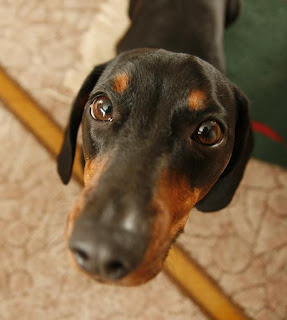 Related: Video on Otto, "The Oldest Dog in the World"
Those Special Dachshunds: Iori says "Wooof!" I'm Iori from Estonia. And of course Anni who is writing this letter for me. I thought to write and introduce myself to you. Have you ever heard about Estonia? hmm..maybe not. But right now we have so much snow here and I love it. That's funny, because I hate water. Actually I wanted to tell you all a little story. "One fine morning when I went for my everymorning walk with granpa, our neighbors were just about to go to work, but stopped for a breif talk. Mrs. neighbor asked: "How come is Iori so shiny?" And gandpa answerd: "I polish (with shoe polish) him every morning before we come out! "....grandpa and Mr. neighbor started to laugh, but Mrs. neighbor was with serious face. You see, for a minute she thought it was true." Well that was it. I hope it was as funny for you as it was for me. Joey and Maggie I wish you all the best for the New Year and may all your wishes come true! We could stare at this fine piece of Dachshund art for days on end. Life is good. From youtuber ShootTheMan: Two wiener dogs playing on the beach, with no apparent authority. 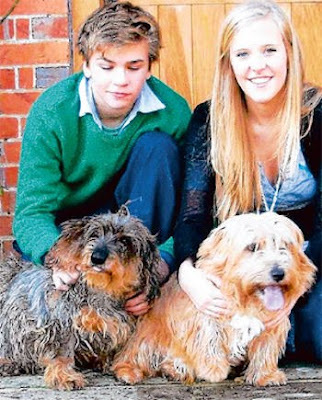 “After an extensive search of Chiddingfold Wood with Gussie, we had almost given up hope of seeing Bertie alive again,” said his owner, 19-year-old Camilla St Aubyn. However, six days after his disappearance, she said she heard some faint barking from the fields and decided to investigate. "I was about to turn home in despair when Gussie started straining on his leash and pawing the grass. Meanwhile, her 14-year-old brother Edward began to dig, eventually bringing an exhausted Bertie to the surface. 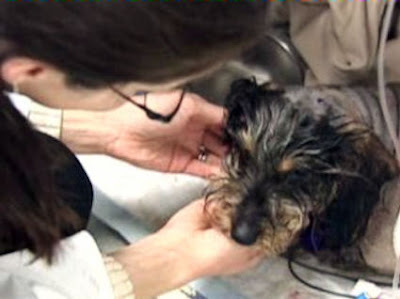 Bertie was seriously dehydrated and needed immediate medical attention, but is recovering. Read his story at Get Surrey. 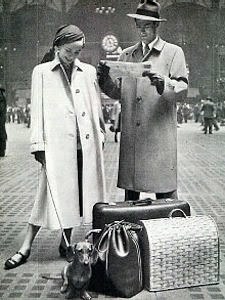 There sure have been a rash of news stories about European Dachshunds trapped underground lately. What's a Dachshund to do? Meet handsome longhair 'Simon,' and his new forever human Lizzie Katz, who hail from Portsmouth, New Hampshire. Simon has had a tough life - he ended up on the euthanasia list at a crowded Indiana shelter, and was then shipped to a shelter in New Hampshire with better prospects. He was adopted in 2008 after a few weeks in the new shelter, but was returned last week, when a toddler in his household was scaring him. Third times a charm as they say, and it looks as though Simon has finally found his perfect match: his new human is studying occupational therapy and "is used to adjusting for the needs of those challenged with disabilities." Miss Katz said "He already knows where anything is... you would never guess he is blind. He's the best dog in the world." Read all of Simon's story at Foster's Daily Democrat. Crazy stuff. He's gotta be dizzy after this! 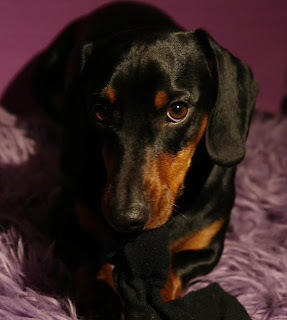 Via youtuber bepls618, who notes: This is our 1yr old dachshund Ziggy, he is crazzzzzzzzzy but we love him. This is my husbands race track from when he was a kid, we decided to set it up for our daughter, turns out the dog enjoys it more! 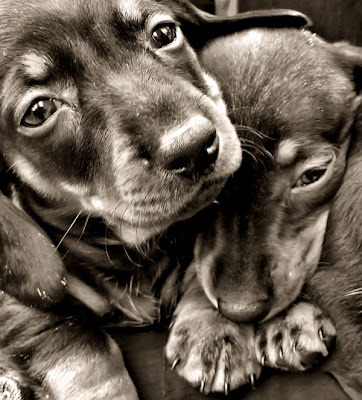 You've got the Snuggie, you've got the Snuggie for dogs, but do you have a Dachshund CuddleRoo? Yep, it's a Snuggie knockoff just for Dachshund Lovers, and it features a pouch in front for you-know-who. It's a blanket...it's a pillow...it's a CuddleRoo™! 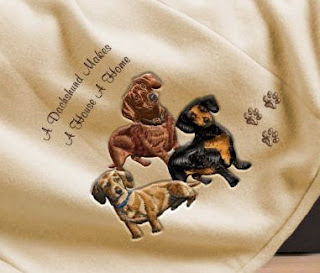 Dachshund lovers will enjoy snuggling beneath a polar fleece sleeved blanket - that also folds into a decorative pillow! Blanket features a front pouch so owner and pet can stay warm. Or, the pouch can store your remote, snacks and other essentials. Another pouch inside the blanket keeps your feet toasty, too. 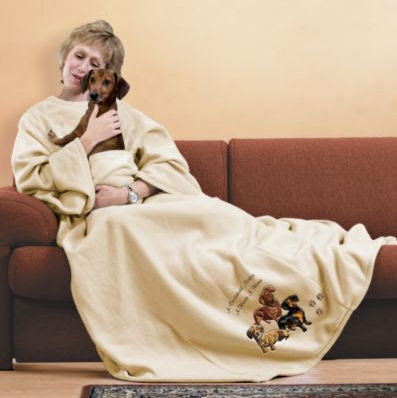 Cuddle with your beloved doxie with this super-comfy polar fleece sleeved blanket, only from The Bradford Exchange. Blanket's neutral design matches any decor. $59.95 at Collectibles Today. Original photo circa 1964, source unknown. Ain't Too Proud To Beg, But Is It OK For Our Backs? Jane's question: What are some ways to keep a dachshund's back healthy and strong? Other than preventing accidents, are there any exercises or supplements I can give my dog? 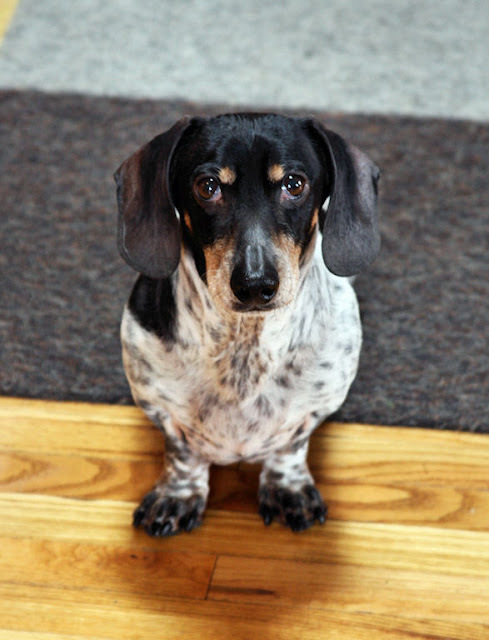 Heather Oxford, DVM: As you may know, many dachshunds have a hereditary back condition called Intervertebral Disc Disease (IVDD). This causes the discs to slowly degenerate, which makes them less resilient shock absorbers. Any activities that cause compression through the spine are considered high-risk for disc herniations and neurological problems including paralysis. Such activities include running down stairs, jumping down from furniture, or jumping up and down on the hind limbs. At CARE, we encourage spinal flexibility and core strength by dozens of exercises. One such exercise is sitting up, a.k.a. "begging." This is a core strengthener that helps protect the back from injury. Also, I recommend fish oils that have concentrated amounts of omega-3s such as DHA and EPA. Not all fish oils are created equal, so make sure yours is independently tested for mercury and other contaminants, and that it meets its label claims. We really need to know the truth because every time we sit up and look incredibly adorable, Dad tells us to stop. 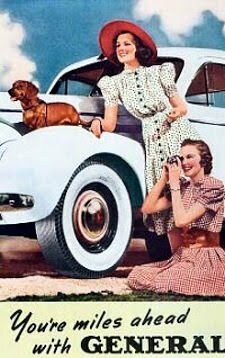 What's a wiener dog to do? 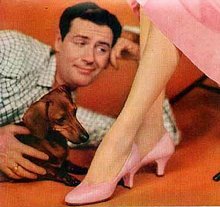 For the Dachshund Lover who thinks they have everything, Dachshund tennis shoes or sneakers will put an extra spring in your step. 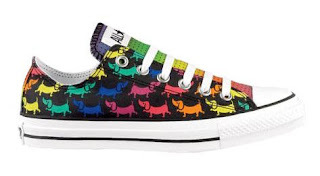 Converse All Star Lo Rainbow Dogs - Black - available in limited sizes for men and women, $49.99 at Journeys. 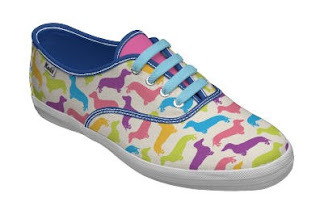 Or you can custumize your own pair of Keds, choosing from color, print, trim, and details by a company called Dog Art Design on Zazzle. $62.80, Women's. Parry Gripp is back with another wiener dog song. On the tails of Wiener Dog Riding Skateboard and Wiener Dog On A Minimoog comes this little gem titled Hot Dog Time! Parry Gripp and his songs have a huge following; this new video has been viewed almost 14,000 times in just 2 days. Without hesitating, Mattox agreed to the surgery and Molly was rolled into surgery. By all accounts, the $3,000 surgery was a success. Molly now walks with the assistance of a wheeled cart. “Molly’s vets at the Craven Animal Hospital who treat her, told me about the cart,” Mattox said. She purchased the cart, trademark name Eddie’s Wheels, online for $400. “People think I am crazy, but I could not put her down. It breaks my heart to think that no one would go this route. I would encourage people to save their animals; they can cope with it,” Mattox said. Read all about Molly, who will soon be certified as a therapy dog so people can benefit from her misfortune, at the Sun Journal. As they say: If life throws you a lemon, make lemonade. When the tree comes down and the cookies and candy are gone – what's left? Here in the desert you might have some uninvited guests, by the thousands, referred to as the domestic ANT! Heidi's human had sprayed her house after the holidays to eliminate her unwanted guests. After a few days, the ants returned, so a heavy spray was then applied. Heidi and her sibling were playing as normal, when later the owner realized she wasn’t being herself. She immediately visited her vet, who examined Heidi. Not long after her owners left the vet’s office, a phone call came – Heidi had gone into convulsions and passed. Rest in Peace little one. Read more at the Mesquite Local News. No, really, you ain't. Happy 75th Birthday Elvis. On his 75th birthday, Elvis is still everywhere. So are these 'Hot Diggity Dog' figurines. This Dachshund figurine is titled 'The King Weiner.' We miss you Elvis. 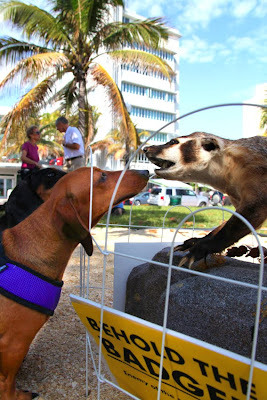 By our friend doxieone, who notes: Honey is one hound dog who is not in favor of Elvis!